Nearly 3 million U.S. workers suffered nonfatal injuries and illnesses in 2012, according to data from the Bureau of Labor Statistics. Virtually every workplace in the U.S. carries some risk for work-related injury or illness, whether it is a fall on a construction site, asbestos exposure in an office building, or a slip-and-fall accident in a restaurant. If a work-related injury keeps you from being able to work for more than a week, you are eligible to receive disability benefits through workers’ compensation. Workers’ compensation is a no-fault insurance program that compensates workers for medical treatment and lost wages. If the work-related injury leaves you with a permanent impairment, you can become eligible for permanent partial disability benefits or permanent total disability benefits. Your eligibility for workers’ compensation is determined by your employer or your employer’s workers’ compensation insurance carrier. The best way to ensure that your employer takes your claim seriously is to retain an experienced New Jersey workers’ compensation lawyer. An experienced attorney can help you obtain permanent disability benefits, as well as help make sure you receive just benefits for the duration of your injury. If you have suffered a work-related injury that resulted in permanent impairment, contact Maggiano, DiGirolamo & Lizzi. Our skilled attorneys have decades’ worth of experience negotiating with employers and insurance companies, and that experience helps us fight for full compensation for our clients. 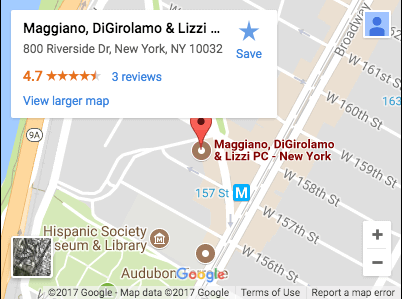 You deserve compensation for your injuries, and Maggiano, DiGirolamo & Lizzi can help you get it. If you are unable to return to work due to a work-related injury or illness, call (201) 585-9111 or contact us online to schedule your free and confidential consultation. What Are Permanent Partial Benefits? If you are permanently impaired due to a work-related injury or illness, you are eligible to receive permanent partial disability benefits. Those who qualify for permanent partial benefits are permanently disabled but are able to return to work in some capacity. Permanent partial disability depends on the concept of “maximum medical improvement.” After suffering a serious work-related injury, a worker can obtain temporary total disability benefits, which are compensation for lost wages while the worker recovers from the injury. After medical treatment (and rehabilitation if necessary), if the impairment remains, the doctor can find that the patient has reached maximum medical improvement. (In other words, no additional treatment will cure the injury or illness.) When the period of temporary benefits ends and the worker is at maximum medical improvement, then he or she is eligible to start receiving permanent partial or permanent total benefits. Permanent partial benefit rates are calculated according to the percentage of the worker’s body affected by the injury. The payment rate, percentage of disability, and length of disability for certain “scheduled” injuries are detailed in the schedule of disabilities. For example, if a worker suffers a disabling injury to 50 percent of one hand, he or she is eligible to receive $29,722 in disability payments over 245 weeks. Some workplace injuries are not included in the schedule, such as injuries to the back, lungs, or heart. Payment for these types of injuries also depends on the percentage of disability. What Are Permanent Total Benefits? If you are permanently disabled and unable to return to work due to a work-related injury, you are eligible to receive permanent total disability benefits. Permanent total disability benefits are paid weekly for an initial period of 450 weeks. After 450 weeks, the injured worker must show that he or she is still unable to return to work in order to keep receiving benefits. When a worker has lost two major body parts or a combination of body parts (including eyes, arms, hands, legs, or feet), permanent total disability is presumed. Permanent total disability also applies when the worker suffers a combination of injuries that, when combined, render the worker completely unable to work. Rates for permanent total disability benefits are based on a percentage of the worker’s average weekly wage, rather than the severity of the disability. Permanent total benefits are paid at 70 percent of the worker’s average weekly wage, but not to exceed 75 percent of the statewide average wage or fall below 20 percent of the state average. As of 2014, the New Jersey average weekly wage is $1,123.80; therefore, the maximum weekly payment for permanent total benefits is $843, and the minimum weekly payment is $225. The Second Injury Fund was established in 1923 to benefit workers who are already partially disabled. If a partially disabled worker suffers a work-related injury that renders him or her completely disabled, the Second Injury Fund will contribute to the employer’s disability payments. In these cases, the employer is responsible for paying benefits incurred by the latest injury only; the Second Injury Fund will make up the difference, paying out permanent benefits. Payments from the Second Injury Fund start when disability payments from the employer cease and continue for the rest of the worker’s life (unless he or she becomes gainfully employed). Obtaining permanent disability benefits and maintaining benefits over time can be a complicated process. During such a difficult and emotional time, it is important to have an experienced personal injury lawyer on your side. Maggiano, DiGirolamo & Lizzi have more than 80 years’ worth of combined litigation experience and have achieved a number of significant verdicts and settlements for injured clients. Maggiano, DiGirolamo & Lizzi have earned a rock-solid reputation among insurance adjusters, employers, and fellow attorneys. Our vast resources and years of experience allow us to approach each case with vigor and fight aggressively for our clients’ interests. If you have been injured at work and are seeking permanent disability benefits, call (201) 585-9111 or contact us online to schedule your free and confidential consultation.